Alexandria, VA— PBS’ first American drama in nearly a decade is inspired by real events of Civil War Alexandria, Virginia. This historic city celebrates the national spotlight on its heritage by presenting new visitor experiences for fans of the upcoming PBS series, MERCY STREET. Premiering on Sunday, January 17, 2016, at 10 p.m., MERCY STREET will follow six episodes of the final season of “Downton Abbey” on Masterpiece. The six-episode series takes viewers beyond the battlefield and into the lives of Americans on the Civil War home front. More than two dozen new tours, exhibits and events have been planned in Alexandria, kicking off in January 2016 when the show debuts. Set in 1862, MERCY STREET follows the lives of two volunteer nurses on opposite sides of the conflict; Mary Phinney (Mary Elizabeth Winstead), a staunch New England abolitionist, and Emma Green (Hannah James), a naive young Confederate belle. The two collide at Mansion House, the Green family’s luxury hotel that has been taken over and transformed into a Union Army Hospital in Alexandria. Just outside of Washington, D.C., Alexandria was a border town between North and South and the longest Union-occupied city of the Civil War. Ruled under martial law, Alexandria was the melting pot of the region, filled with soldiers, civilians, female volunteers, doctors, wounded fighting men from both sides, speculators, spies, and African American refugees. Today, visitors can get a close look at the story at Alexandria’s historic sites, with new visitor experiences launching in 2016. Visitor experiences uncover the real people behind the characters on the show, the realities of Civil War medicine, changing roles for women, and the breakthrough experience of enslaved African Americans claiming their freedom. Located on the Potomac River waterfront just minutes from D.C., Alexandria hums with a cosmopolitan feel against an extraordinary historic backdrop. With luxurious accommodations just steps from historic sites, galleries, boutiques and restaurants, visitors can turn a “Mercy Street” excursion into a weekend getaway. Deluxe guest room at the luxurious Hotel Monaco Alexandria with modern Civil War-inspired décor and rich Civil War history as the former location of the Marshall House where two of the first and most iconic deaths of the war occurred. Two hand crafted cocktails inspired by the Civil War era at adjacent restaurant, Jackson 20. “Lee’s Temptation” will feature Bulleit Rye, Sweet Vermouth, Fernet Branca and Flamed Orange Peel, while “Virginia Gentleman” will feature Buffalo Trace Whiskey, American Honey Liqueur, Angostura Bitters, Lemon and Ginger Beer. Two tickets to the Carlyle House Historic Park to learn more about the family and real events behind the PBS’s “Mercy Street.” Carlyle House and the adjacent luxury Mansion House Hotel, owned by the Green family, acted as a hospital and staff quarters during the Civil War and inspired the show’s characters and stories. 5 percent of proceeds from the package will be donated to the American Red Cross to help military members, veterans and families with emergency communications, training, and support to wounded warriors and veterans. Monaco Alexandria, a Kimpton Hotel’s “Have Mercy” package starts at $179 per night, not including tax. Package is available from January 17 – July 1, 2016. To book the “Have Mercy” package, use rate code MERCY at www.monaco-alexandria.com or call 703-549-6080. From 1861-1865, the U.S. Army used Carlyle House, then the home of Emma Green and her family, and the adjacent Mansion House Hotel as a hospital and staff quarters. The people who lived and worked at this site in Alexandria and their real life stories have inspired the PBS television show, “Mercy Street”. The owner of the house and hotel, James Green, was one of the richest men in town and made a deep historical footprint on Alexandria. Fort Ward Museum has an ongoing exhibit which features original medical instruments and equipment from the Civil War period and information on Union Army hospital sites in Alexandria. Experience an inside access tour of 19th century Alexandria. Inspired by the PBS mini-series “Mercy Street,” accompany a trained military historian through Civil War era Alexandria and learn the actual history behind the TV show. Get behind the scenes stories of locations where “Mercy Street” characters lived, worked, and played. Discover the real-life stories and locations of soldiers, citizens, and former slaves that inspired the PBS drama “Mercy Street” in this walking tour of Old Town. Discover the challenges, triumphs, and controversies of life behind the front lines in an occupied city during the Civil War. See the locations of hospitals, hotels, prisons, and more that filled Alexandria during four years of conflict. Tour length is 3 hours and the route is approximately 1.75 miles. Admission $15. Tour starts at The Lyceum, 201 South Washington Street. Parking is not available at The Lyceum’s lot for this program. This guided citywide tour highlights the history behind Mercy Street, with stops at important Alexandria Civil War sites including Carlyle House and the grounds of the former Mansion House Hospital. Visitors will have exclusive after-hours access through this tour to explore the exhibit featuring period artifacts and the stories of soldiers, nurses, doctors and the prestigious Green family who owned the house and hotel during the Civil War. Tour Dates: March 25, 26, 27 & April 1, 2, 3 at 2:30 p.m. Walk the same streets as the Green family and all of your favorite characters from MERCY STREET. Based on the new PBS series, MERCY STREET, Alexandria’s The Mercy Walk tour will give visitors and locals alike a feel for Alexandria and what it was like to live in an occupied city during the Civil War. This tour includes stops at the former Marshall House, the Confederate Statue, James Green’s furniture factory, and the only portion of the Mansion House Hotel still standing today. Join us to hear the true stories of Alexandria, a true microcosm of the Civil War all within one city. Space is limited! Ivy Hill Cemetery presents a self-guided tour on the Green family and Frank Stringfellow, who are featured in the PBS drama “Mercy Street”. Chartered in 1856, Ivy Hill Cemetery is the final resting place of the Green family and Frank Stringfellow. Guided tours will be available upon request. Maps for self-guided tours are available at the Ivy Hill Cemetery office from 8 a.m. to 4 p.m. Also available for download from Ivy Hill Cemetery’s website. The Alexandria Library’s Special Collections played an integral role in providing research and information to promote historical accuracies in the series. Join us from January 9 through February 16 as the Library celebrates PBS’s recognition of Alexandria’s place in history with a variety of programs that will provide insight regarding life in Alexandria during the Civil War. January 23, 2016, 8-11 p.m. Enjoy an evening from the 1860s in the historic ballroom at the Civil War Ball. The ball will include live music, dance instruction, and period desserts. Period attire, either civilian or military, is encouraged. The ball is from 8:00 – 11:00pm. $45 in advance, reservations are required. Dance Classes for the Ball will be held January 7, 14, and 21 from 7:30 – 9:30 p.m. Cost is $12 per class or $30 for the series. January 25, 2016 at 7 p.m.
During the Civil War, Alexandria became a Union occupied logistics and medical center. The Athenaeum was employed as a Union hospital for a short time and later as the Headquarters of the Union Commissary General. Alexandria Historian Tom Schultz will discuss the heroism and challenges that doctors and nurses experienced in ministering to the wounded in Alexandria and the advances in women’s rights and medical science as a result of their efforts. January 28, 2016 at 7 p.m.
One old home in Alexandria houses both the past and the present. Two families, one modern, one living during the Civil War, find that their stories are intertwined. Can the modern family escape the weight of the slavery and the Confederacy? January 29, 2016, 7 p.m. Enjoy 19thcentury-inspired food and wine for the modern palate and this Civil War Wine Dinner. This five-course wine dinner will feature Gray Ghost Vineyards, whose wines are created on lands “Gray Ghost” Confederate John S. Mosby and his men operated upon during the Civil War. Doors open at 7 p.m. Dress: Business Casual. January 30, 2016, Saturday, at 10 a.m.
Go behind the scenes and learn about the true story of the nurses, doctors, soldiers and Alexandrians who star in PBS&apos;s new series “Mercy Street.” The program will begin in one of the original lobbies of the famous hospital, normally closed to the public, with coffee, bagels and a presentation led by Sarah Coster, former Director of Carlyle House, and Audrey Davis, historical consultant for “Mercy Street” and Director of the Alexandria Black History Museum. Then, go on a tour of the Carlyle House, the Green family&apos;s stately Southern mansion, whose history goes back to the 1740s. A lecture on medical care during the Civil War period presented by Von Barron, Civil War medical historian and interpreter. Mr. Barron will cover general medical knowledge and practices of the period, and military hospital facilities of the time, both in the field and urban centers like Alexandria. Tickets for the lecture can be purchased by calling The Lyceum at 703-746-4994, or online at shop.alexandriava.gov. A Presentation by Historian Pamela D. Toler, PhD. “Heroines of Mercy Street,” a new book by historian Pamela Toler, tells the true stories of some of the remarkable women who worked as nurses at the Mansion House Hospital, Alexandria’s largest during the Civil War. Most of these women had little or no experience with nursing, but they wanted to serve their country and do something to help ease the enormous suffering from disease and battlefield wounds during the conflict. They often taught themselves nursing under adverse circumstances, including active hostility from the surgeons they worked with, and helped to create a profession that did not exist before the war. “Heroines of Mercy Street” is a companion history to the new PBS drama “Mercy Street,” which airs at 10 PM beginning on January 17th. The book will not be available to the public until February 16, 2016, but The Lyceum and other Historic Alexandria museum stores will have it on the shelves after that date. While you’re here, you can also view the new exhibition “Alexandria’s Nurses & Hospitals During the Civil War” on view by The Lyceum Museum Store, and find many other books related to the war and nurses of the period. February 6, 2016, at 11 a.m. Writer, editor, and Civil War researcher Paula Whitacre will deliver a lecture on Harriet Ann Jacobs and Julia Wilbur, two women who lived in Alexandria during the Civil War and wrote about their experiences. Harriet Ann Jacobs was an African-American writer who escaped from slavery and was later freed. She became an abolitionist speaker and reformer. She wrote an autobiographical novel, “Incidents in the Life of a Slave Girl.” Julia Wilbur, a relief worker from Rochester, NY, came to Alexandria during the Civil War. She kept a detailed diary from the 1840s through her death in 1895, some of which Paula Whitacre transcribed and annotated. Alexandria spent four years as an occupied city. During that time, daily life became quite different for residents who remained in the city, and in many cases, the war changed the course of women’s lives. Women of Alexandria, from Antebellum to the 20th Century will illuminate an important side of the city’s history that we feel has been under-investigated: the effect of the Civil War on the lives of Alexandria’s women. This program generously supported by a grant from Virginia Foundation for the Humanities. This special tour interprets the Lee-Fendall House from the perspective of its enslaved inhabitants, exploring the unique experiences of slavery in the city. Hear the true stories of “contrabands,” as seen in the PBS drama “Mercy Street.” Special behind-the-scenes access is granted to areas not normally open to the public. Admission $8. Join Chris Foard MSN, RN (The Foard Collection of Civil War Nursing) for an in depth lecture on the diverse practices of male and female Civil War nurses. Discussion includes an important but largely neglected aspect of Civil War nursing - roles and responsibilities of nurses in relation to current practices of today. Lecture is based on historical analysis from letters, documents, books and diaries from The Foard Collection of Civil War Nursing. This event is co-sponsored by Carlyle House Historic Park (NOVA Parks) and The Lyceum (Office of Historic Alexandria) and will take place at The Lyceum, 201 S. Washington Street. April 23, 2016, 11 a.m. to 4 p.m. Within eyesight of Washington, DC on the Potomac River waterfront, Alexandria, Virginia is nationally recognized for its acclaimed, chef-driven restaurants, bustling boutiques and dynamic arts set against a backdrop of 18th- and 19th-century architecture. 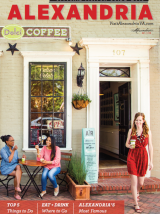 Old Town Alexandria hums with a cosmopolitan feel and a walkable, dog-friendly lifestyle—a hidden gem tucked beneath the nation’s capital.